Cloudy early then partly cloudy and windy this afternoon. High around 70F. Winds NNW at 20 to 30 mph. Higher wind gusts possible.. The emerald ash borer has been spotted in the Fort Worth area. Arizona ash shade bleachers near the Challenger Little League fields in Waco. An invasive beetle’s spread is threatening all ash species. Emerald ash borer larvae feed on the inner bark of ash trees, damaging their vascular system and typically killing them within five years of infestation. Arizona ash shade bleachers near the Challenger Little League fields in Waco. An invasive insect’s spread is threatening all ash species. The emerald ash borer is a green beetle native to Asia that feeds on ash trees. Baylor University biology professor Joseph White has been studying the ash trees in his backyard a little closer since news that officials confirmed an invasive beetle that decimates the trees was present in Tarrant County, less than 100 miles away. Though the emerald ash borer has not been spotted in McLennan County, its slow spread across the continent means the future looks bleak for the area’s ash trees. 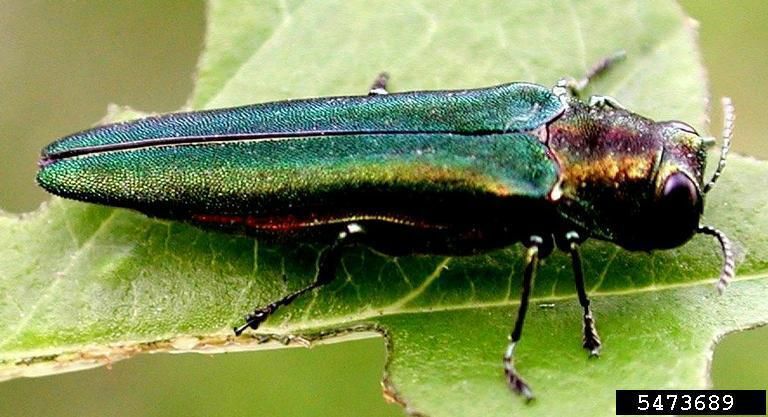 The beetle was first documented in North America in 2002 near Detroit and, as of last year, had killed millions of ash trees in 35 U.S. states and the Canadian provinces of Ontario, Quebec, New Brunswick, Nova Scotia and Manitoba, according to the Emerald Ash Borer Information Network. The adult beetles nibble on ash foliage, causing little damage. But the larvae feed on the inner bark of ash trees, disrupting the tree’s ability to transport water and nutrients, according to the network. White, whose background is primarily in forestry and ecosystems related to trees, is among the experts nationwide monitoring the emerald ash borer’s spread. All species of ash are susceptible to the beetle, and trees typically die within five years of infestation, he said. The half-inch-long metallic green beetles have no natural predators in North America, though professionals have considered introducing a wasp that preys on the beetles in their native Asia, White said. Ash trees make up about 5 percent of the Dallas-Fort Worth urban forest, where the presence of the beetle has been confirmed, according to the Texas A&M Forest Service. The trees in general do not handle wounds or damage well, said Brian Williams, a certified arborist and owner of Brian’s Tree Services in Valley Mills, which has served the area about 22 years. Williams said he attended a conference last year and learned any ash trees not treated within the next 10 years are likely to die. While chemical preventive treatments are available, they are costly, have to be administered by a professional and are not guaranteed to work, he said. “You could easily surpass the value of the tree in treating it within a couple years,” he said. Homeowners and businesses rarely ask for ash trees anymore and are discouraged from buying them when they do ask, he said. As the trees die, it is unlikely each one will be replaced with a new tree. Cameron Park, for instance, could lose 10 to 30 percent of its tree canopy, Williams said. From soil erosion to the butterflies and birds that rely on ecosystems the trees support, the long-term effects remain unclear. “I’ve looked through the literature on this and I don’t see anyone addressing the loss of this tree on the wild land,” he said. In developed areas, in addition to effects on wildlife and other vegetation, dying trees can mean decreased property value and risks associated with collapse or falling limbs, he said. Williams spent his younger years shadowing his father, who is still an arborist. Ash are considered fast-growing shade trees, and there was a boom in planting them locally about 50 years ago, he said. How and why the beetle is traveling across the nation is a big question, White said. The females can fly 3 to 10 miles with eggs, he said. But it also appears transportation of firewood taken from dead infected trees has aided the spread. Infected trees would need to be ground up and burned on site to prevent the beetle from spreading, White said. Signs of infestation include yellow, thin or wilted foliage, unusual woodpecker presence and pecking holes, D-shaped beetle exit holes, and shoots growing from roots or a tree’s trunk, according to the United States Department of Agriculture Animal and Plant Health Inspection Service. To report suspected emerald ash borers, call 1-866-322-4512.